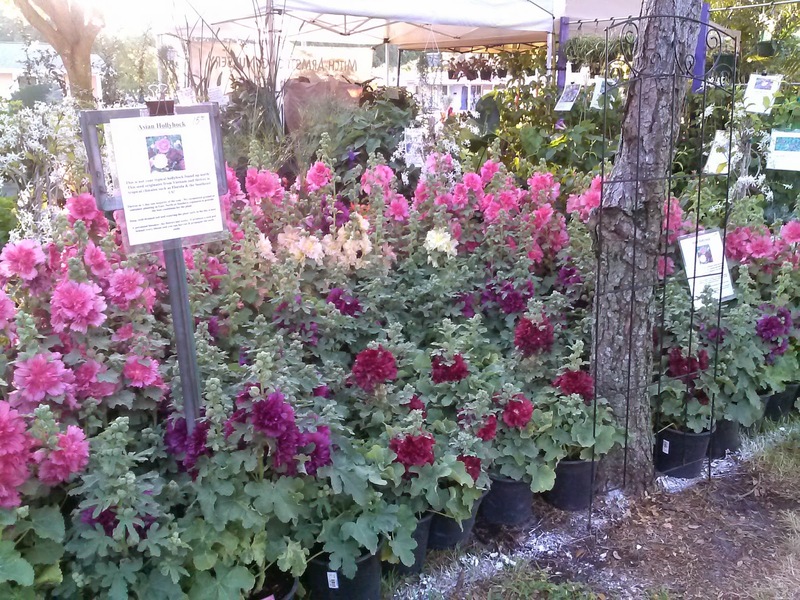 We know it is definitely Spring, when it's time for us to journey to beautiful Leu Gardens in northwest Orlando, for their annual Spring Plant Sale. One of our favorite shows in one of the most beautiful botanical gardens of our grand state of Florida, this sale attracts thousands from around the state to come visit the gardens (for free ! ), check out over 50 plus high quality plant vendors from around our State with all their specialties ! Leu always marks the time when we are able to bring our beautiful Vietnamese Tropical Hollyhocks out, always a crowd favorite. In bud and ready to bloom in our garden, the colors include Rose, Crimson, Purple and Peach. In addition, we always like to bring out our most rare, our most unusual, our most dramatic specimens that will please collectors and regular gardeners alike ! From Shooting Star Clerodendron, to aromatic Gardenias, to Passion Vines galore, to blooming Desert Rose, to rare Thai snow Ixora, from Midnight Ginger, to lots of butterfly and bee friendly specimens like yellow milkweed, white Almond bush, native Rosinweed, Celosia, Delphiniums and Foxgloves ! Unusual succulents and cacti, aromatic Lavender and lush White and Orange Birds of Paradise, the list could could on..and does ! Bring your carts ! Unfortunately, the gardens does not have a service providing carts for you so we encourage you to bring your garden carts and whatever you have on wheels so you can truly have an easier time of collecting your purchases. More about us, we take cash and credit cards, no checks. We take ALL credit cards as we have the "square reader" that accepts all. We only ask for $5 minimum purchase. We also go the extra mile to give you info about us, your plant purchase etc, so we will be handing out lots of colorful paper flyers. Where to find us? We are in Booth #4...it is at the back of the gardens, once you go thru the Rose pavilion if you are heading down the center, or you will come across us if you follow the winding pathway. We have a large corner spot and if you look west from our spot, you will see the spectacular Garden clock ! Okay, hope all of this helps you to enjoy the sale,we look forward to seeing old friends, making new friends and having a glorious weekend in the Garden !